Creamware jug with loop handle, printed in black. One side shows Lieutenant-Colonel Banastre Tarleton (1754-1833). In the American Revolution he led a Loyalist cavalry unit known as Tarleton's Raiders. Rebel propaganda claimed that he fired on surrendering troops at the Battle of Waxhaws. He became one side's villain and the other side's hero. A member of a leading Liverpool family of merchants engaged in the transatlantic slave trade, after the war he served as a Member of Parliament for Liverpool from 1790 to 1812, and was made a baronet. The print is labelled "Colonel Tarleton" and signed "I. JOHNSON" at bottom left and "LIVERPOOL" at bottom right. The printer has tentatively been identified as Joseph Johnson of Newburgh some fifteen miles from Liverpool. 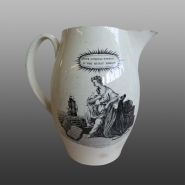 He printed on a jug made at Ralph Wedgwood's factory in Burslem, Staffordshire. The warehouses on the Liverpool waterfront were full of undecorated Staffordshire pots waiting to be shipped out. Colonel Banastre Tarleton, engraved by John Raphael Smith in 1782 after Sir Joshua Reynolds' painting exhibited at the Royal Academy in the same year. The painting is now in the National Gallery, London. The image glamourises Tarleton as a dashing young officer, poised and readying himself for action against the American revolutionaries. The other side shows the personification of Hope, symbolised by her anchor, sitting next to some packages, with a ship setting out behind her. A subject calculated to appeal to a local market of Liverpool merchants. The jug encouraged them to pour beer from it to drink not only to success in their export trade but also to their local 'hero' Tarleton.